Although it is more common to specify in Excel when something is equal to something else e.g. B1=”Sale”, occasionally it is better (and more efficient) to do the opposite i.e. if not equal to xyz then do something. Not equal to in Excel is expressed as <> . So in the example able we could say B1<>”Sales”. This same logic works with numbers i.e. if not equal to zero, sum it would be shown as B1<>0 (note that for numbers we don’t use “inverted commas”. 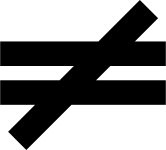 The Not Equal to symbol can be used in any function that can use an equal e.g. IF, SUMIFS, SUMPRODUCT etc.